However, a magazine must always look ahead. In these last three years I have introduced some initiatives to modernise and bring the ICB up to date. I believe the key is to combine traditional paper editorial with the multimedia opportunities that modern technology offers us. So you will still have the possibility of savouring the feel of paper between your fingers, as well as immersing yourself in the twists and turns of the web to download content and in-depth analyses. For now at least, this is the secret of a successful magazine. My friend and colleague Jutta Tagger, who edited the ICB before me, reminded me that 30 years ago we had just started experimenting with the fax machine. Of course then, the internet was still just an idea in some of the great and crazy brains at NASA… We used to send news by post, wait for the response and then send a reply back again! Creating a bulletin, even if only a few pages long, was no mean feat. I don’t know if it is easier now. The risk nowadays is of being overcome by the wealth of information out there. The mass of material available gets the adrenaline flowing and we all need greater and quicker decision making skills. Once more, in this edition we have some varied and interesting content. In my opinion, the best article is the first part of the ‘Ukraine dossier’. The author, Yuri Chekan, tells us, in minute detail, about what he calls a thousand-year-old tradition. Make sure you read it! ‘Composer’s corner’ is dedicated to two very different composers in terms of style and background. Wolfram Buchenberg and Romuald Twardowski, as well as giving wonderful interviews, have also both given us two brilliant tips from their creative experience and work. It is a great honour for me and, I am sure, for all of our readers. We must use them and make the composers happy! 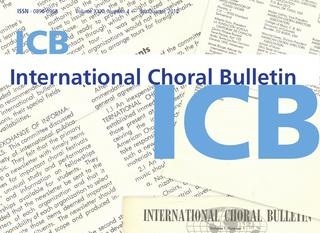 The articles on choral technique in this edition are about the practice of overtone singing, a singing method that is no longer only for monks and shamans. Why don’t you have a go! 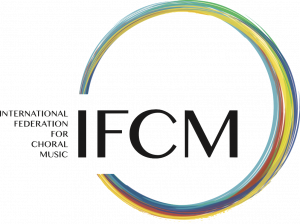 Our Vice President Stephen Leek writes about the right approach to contemporary choral music, a type of music that not everyone has the courage to try because it is sometimes known, unjustly, as difficult to understand and to sing. Please follow his advice! And then every edition has something new…. In this edition of the ICB it is ‘Letters to the Editor’. Now I know I have not invented the wheel; all serious magazines offer the possibility of communicating with the editorial staff. We also had the possibility but let’s say we did not have the means to drive it before. You will find a page inside explaining in detail how to get in touch with us. My colleague Graham Lack and I shall await your comments on anything to do with editorial content: advice, criticism, proposals, anecdotes, interesting facts … isn’t all this use of multimedia in the name of tradition?